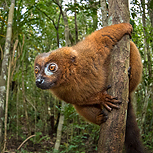 The island of Madagascar offers such an incredible array of totally unique species: lemurs may be the first that come to mind but chameleons and an array of other rainforest life offer a dazzling diversity. Visiting 6 reserves over 16 days we will get the best chances possible to experience this diversity with expert local guides and trackers where beneficial too. Des has been working here for many years and his experience also means we have strategically chosen hotel locations and streamlined our travel routes to minimise what can be challenging journey times between locations where possible so that we can enjoy the maximum that this majestic island has to offer – Mousel lemur, Indri, Giraffe-necked weevil, Satanic Leaf-tailed Gecko: even the names are enough to wet the appetite! Day 1: Depart UK/Europe for flights to Antananarivo, Madagascar. Upon arrival, you will be met and collected from the airport, and transported to your lovely overnight accommodation. Day 2: We will take a flight heading south, where you’ll be staying at an idyllic hotel near the sea. After checking in and a quick lunch, we will head straight out to a small private reserve not too far away. This will be our first opportunity to see and photograph some wild Lemurs! Days 5: After a good night’s rest, we will have our final breakfast at the restaurant – do watch out for the croissant-stealing Ring-tailed Lemurs though! We will then drive back to the airport to catch a flight back to the capital city where we will spend an evening at the hotel. Day 6: We will drive east to a small community run rainforest reserve. The habitat in the eastern region is very different to our previous location. The forest here is moist but also cooler. Therefore some of the animals and plants found in this environment are very different to those seen in the south. In the evening we will go for a night walk looking for some of the nocturnal species such as Mouse Lemurs and amphibians. Day 16: Depending on our flight schedule, we will be taken to the airport to catch our homeward flight and we will arrive in the UK on 27th September.